So, have you been enjoying my brother, Lance's, posts about his travels in Taiwan? Kind of makes me want to take a trip there...although, not right now, WAY too HOT! Of course, it's plenty hot in DC too, but, we are doing our best to embrace and beat the heat. Inspired by the happy family movement and various others, last week for Family Home Evening, we sat down and made our own summer bucket list. It was fun for all of us to dream up things to do to fill our summer days and nights, and we are all looking forward to a jam-packed and fun-filled summer. In fact, it has been so jam-packed already that the list is still just scribbled on a legal pad and not yet ready for prime time. But, I will post it in the next couple of days just in case you want to know what we're doing in our corner of the universe to while away the hours over the next 2 months. School ended last Friday and our summer began in earnest Monday morning. Not surprisingly, no one except the parents felt like sleeping in, so we were up and at 'em at our regular, yet far too early hour for any day, much less a vacation day. We didn't have much on the agenda for Monday, a serious oversight and inexcusably rookie mistake that has been remedied. Our troops, we know, need structure, activities, schedules, commitments, tasks, chores, diversions, projects, and exercise, lots and lots of energy burning, full-throttle, exhausting exercise. In fact, we did have a plan, but it wasn't until that evening and the anticipation failed to carry us through a very long day. 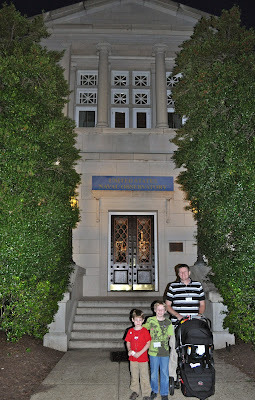 My parents came to visit last month and one of the things my Dad has long wanted to do in Washington, DC, is visit the United States Naval Observatory. This is no small feat. They do semi-monthly tours of the observatory, museum, and library, but you have to request a tour well in advance and there is no guarantee if you will get in. So, I submitted our request and while we were ultimately granted admission, it was for this week and not the week my parents were in town. But, it seemed a shame to pass up the opportunity, especially since it is nearly impossible to gain access otherwise because the USNO shares the same physical space as the Vice President's house and they don't let just anybody near that guy. So, we went. On a very overcast night with no visibility. Apparently, on clear nights the resident astronomers actually demonstrate the capabilities of the massive 26 inch telescope commissioned by Abraham Lincoln and built in 1873 that calls the observatory home. Instead, we were treated to a tour of the small, yet informative, museum, the library, which is circular and "holds one of the most complete collections of astronomical literature in the world," and, finally, the observatory itself. The kids were pretty good and mostly patient throughout, but a visit to the USNO really is not an outing designed for little ones. Luckily, part of the tour involved raising and lowering the floor of the observatory, much to the delight of our guys, particularly since they were able to man the controls on the way down. We also saw our first fireflies of the season and 10 deer grazing on the grounds, two major highlights of the evening. And, although the kids were definitely ready to leave by the end, we would recommend adding this to your "things to do in DC" lists with the caveat that you must plan well ahead and probably only as an activity suitable for ages 12 and up. The main building which houses the museum and the library. Claire and Daddy enjoying the tour. 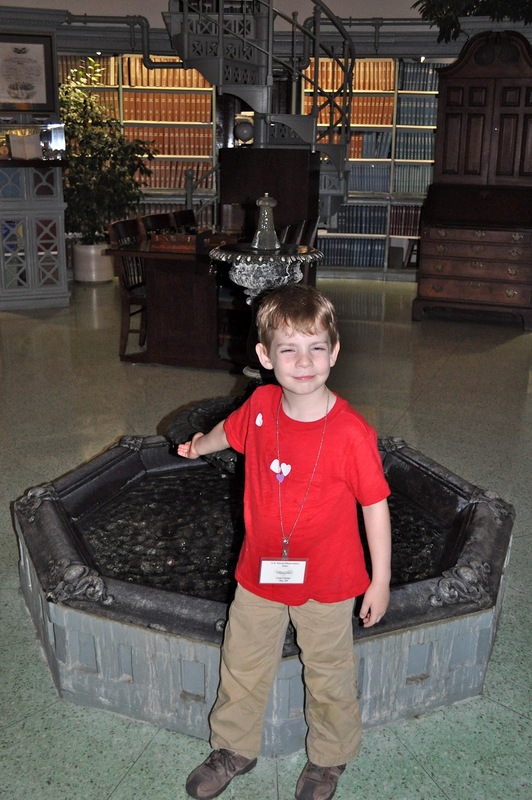 Isaac and the fountain in the center of the library. The observatory from the outside. I forgot to take any pictures inside, but, well, imagine an enormous telescope and you'll have a pretty good mental picture of what we were looking at. Wow, what a cool place to see! It really looks neat. We have been totally loving your brother's posts too because we're moving to Taipei on Tuesday :) I hope you guys have a great summer. I always look to your blog for great ideas of cool DC stuff.